You're ready to upgrade your commercial interiors. It's not enough to move desks and rearrange conference rooms. You want a complete renovation that revitalizes your operations. This isn't a DIY project. You want to ensure job success by choosing the right commercial architecture firm. These key steps can help you navigate the process. If you own your building, you should have on-hand knowledge or accessibility to the requirements for interior essentials like fire protection and ADA access. If you rent your space, keep your building owner in the loop on your plans - or include them in the process. This kind of advanced knowledge makes it easier to work with an architecture firm on everything from new lighting installations to entryway redesigns. In addition, everyone - from the building owner to the tenant - should be on the same page when it comes to the design vision. Be ready to share your brand concept. Whether you sell luxury goods, provide professional services or manage an entertainment venue, your interiors should reflect your organization's core. The best commercial interior design conveys everything customers need to know about your business. Upgraded interiors give employees an improved work environment that increases productivity, creativity and overall job satisfaction. Make sure your ideas are on the right track by making sure your employees are involved in the design process. Listen to their input and incorporate it into your ideas for new interiors. 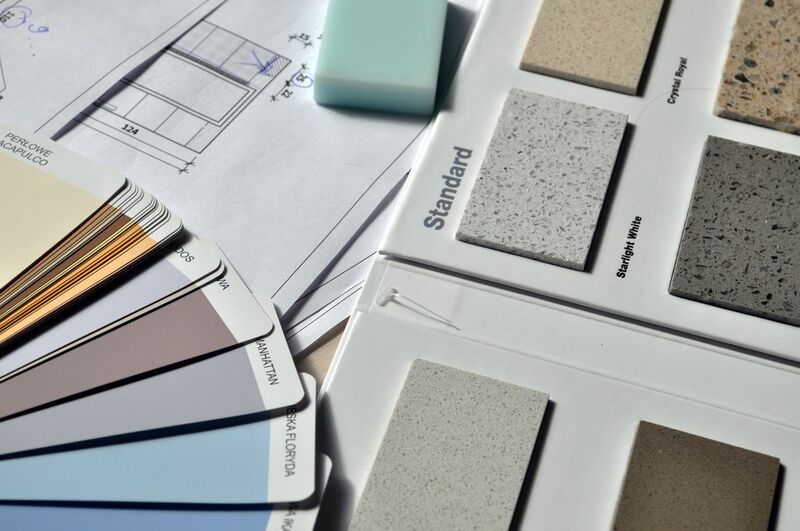 Ask other professionals in your field about their experiences with interior renovations. Start a list of potential firms for your project and take a look at their websites. Consider the range of services offered by each commercial architecture firm and how well their past experiences fit your needs. When it's time to interview different firms, ask about credentials and certification. Review specific portfolio projects and ask about how previous work might apply to your job. Cover basics like construction & FF&E budgeting processes, day-to-day communication protocols, schedule requirements, and contingency planning. Be sure you feel comfortable with the answers. If you want eco-friendly commercial design services, be specific about your expectations. Experienced architecture firms offer sustainable options for all types of interior makeovers. Be clear about design components that are important to your company's culture. Be impressed when a firm offers suggestions that enhance your original ideas. As you work through proposals, don't assume a low bid is your best option. Lower numbers might reflect a firm's ability to implement time-saving techniques and labor-saving schedules. A higher bid could be based on a firm's commitment to durable materials and job-specific detailing. Feel free to ask for clarification. Expect answers that add up. When you choose an architecture firm for your commercial interior design project, you want to feel confident about your decision. We understand. Here at Artech Design Group, we offer more than 30 years of proven expertise. We help make sure your project is a success. View our portfolio to see our decades’ worth of architectural design projects, from retail construction projects, office interior design, healthcare design, educational facility architecture, and more.